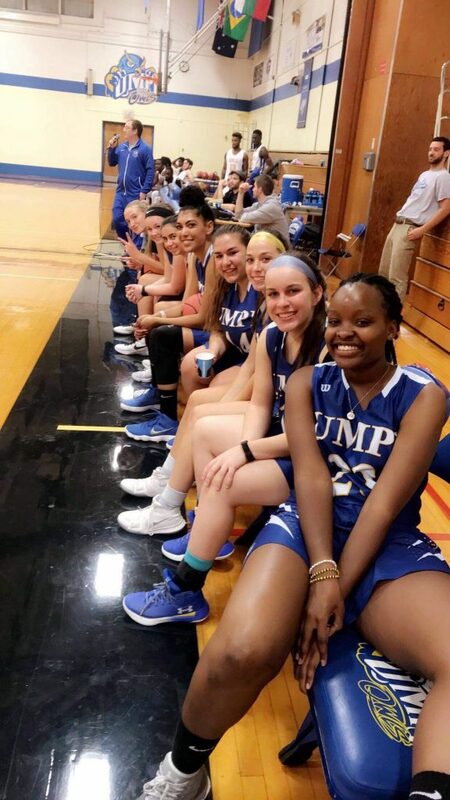 On Oct. 23, the crowd in the Wieden gymnasium enjoyed events by UMPI’s men’s and women’s basketball teams as part of the annual Midnight Madness. The event, run by the UMPI athletics department and SAO, gave the crowd an opportunity to look at this year’s teams. The night was filled with a dunk contest, a three-point shooting contest and crowd members were even given the chance to participate in games to win prizes. The night started at 9 p.m. with player introductions. Players from both teams then participated in a skills challenge, where they would shoot baskets, dribble their way through the court, all while being timed. A timed three-point contest followed. Finally, there was a dunk contest between members of the men’s team. Frederick Crumbly would eventually win the competition. “I really liked Midnight Madness a lot more this year. I felt as if this year’s energy on both teams was a lot higher and I also noticed that more students were willing to be involved in the games. I can’t wait for next year’s event,” UMPI sophomore Brookelynn Garcia said. Members from the audience also got to participate in games on the court. A student even won an HP tablet during the event. The crowd’s enthusiasm filled the night. Both teams are very hopeful for this year’s success of the program. Conference play for the men’s team starts on Nov. 30 in the Wieden gym. The women’s team starts their conference play on Nov. 30 at UMF.